Far from being angry at the storm Broadcasting the Barricades had produced, Reith was delighted. This is a reaction which often surprises people today, who know Reith - later Lord Reith of course - only as the unbendingly stern and puritanical figure which his legend as the BBC's founding father portrays. 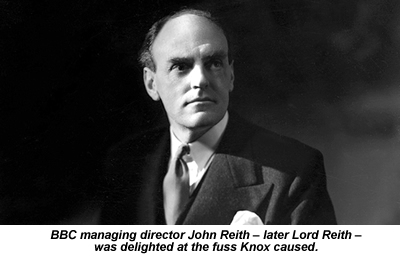 Reith's figures show 2,307 appreciations for the programme, against only 249 criticisms, 194 of which were directed at Knox himself. With more than nine positive responses to the programme for every negative one received, he had every reason to be pleased. Five days later, the BBC's programme board decided to authorise its first April Fool's Day programme, suggesting: “a suitable hoax [...] somewhat on the lines of the Father Ronald Knox transmission”. Knox continued to make occasional BBC broadcasts after all the fuss died down - notably a spoof scientific talk claiming scientists had detected the sound of vegetables in pain - but concentrated mostly on his writing. This ranged from the light detective stories which he wrote for his own amusement to far more ambitious works such 1939's Let Dons Delight, which imagines a series of conversations in an Oxford Common room between Elizabeth I's reign and Knox's own time. Around 1936, he embarked on the mammoth task of producing a new translation of the Bible, the final fruits of which were published in 1950. 1)	Broadcasting the Barricades original script. (BBC archives). 2)	Daily Chronicle, January 18, 1926. 3)	Daily Graphic, January 18, 1926. 5)	Hoaxes and Scams, by Carl Sifakis (Michael O'Mara Books, 1994). 6)	Daily Telegraph, January 19, 1926. 7)	The Riot That Never Was (BBC Radio 4, June 16, 2005). 8)	Studies in the Literature of Sherlock Holmes, by Ronald Knox (www.diogenes-club.com/studies.htm). 9)	The Life of the Right Reverend Ronald Knox, by Evelyn Waugh (Chapman & Hall, 1959). 11)	A Social History of British Broadcasting, by Paddy Scannell & David Cardiff (Wiley Blackwell, 1991). 12)	Evening Standard, January 19, 1926. 13)	Daily Mail, January 18, 1926. 14)	Evening Standard, January 18, 1926. 15)	The Times, January 18, 1926. 16)	Daily Express, January 18, 1926. 17)	Daily Sketch, January 18, 1926. 18)	The Tablet, January 23, 1926. 19)	Weekly Scotsman, January 23, 1926. 20)	Daily News, January 18, 1926. 21)	Irish Times, January 18, 1926. 22)	Daily Sketch, January 19, 1926. 24)	The Times, April 11, 1966. 25)	The Times, August 26, 1957. 26)	New York Times, January 19, 1926. 27)	New York Times, October 31, 1938. 28)	Birmingham Mail, January 18, 1926. 29)	Radio Guide, 1938 (quoted on www.wellesnet.com/?p=296). 30)	Radio Times, June 29, 1967. 32)	The Simple Art of Murder, by Raymond Chandler (reprinted in Chandler's Pearls Are a Nuisance (Pan Books, 1980)). Knox made his own contribution to those rules in a tongue-in-cheek 1929 essay called Ten Commandments for Detective Fiction. He begins by giving his definition of what was then required for a true detective story. “A detective story must have as its main interest the unravelling of a mystery,” he writes. “A mystery whose elements are clearly presented to the reader at an early stage of the proceedings, and whose nature is such as to arouse curiosity, a curiosity which is gratified at the end. His commandments set out the various cheats an unscrupulous writer might employ to put his readers off the scent, and explain why each is unacceptable. Number two, for example, rules out all supernatural intervention as means of solving the mystery. Number eight requires that all clues available to the detective be instantly produced for the reader's inspection too. Number nine calibrates exactly how stupid the detective's slower friend - “the Watson”, as Knox calls him - is allowed to be. The answer, it turns out, is just slightly stupider than the average reader. To hear all ten of Knox's rules enuniciated by Bob Sinfield - Radio 4's own voice of Ronald Knox - click the prompt at the bottom of this BBC page.